The satellite, encased in an aerodynamic, cone-shaped shell that would protect it from the intense heat of launch, would be attached to a sled designed to respond to the forces from the superconducting magnets. When the sled had been accelerated to its top speed of 10 kilometres per second, laser and pyrotechnic devices would be used to separate the cone from the sled. Then, the cone would skid into a side tunnel, losing some speed due to friction with the tunnel's walls. 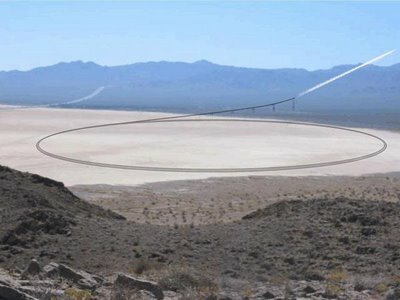 The tunnel would direct the cone to a ramp angled at 30° to the horizon, where the cone would launch towards space at about 8 kilometres per second, or more than 23 times the speed of sound. A rocket at the back end of the cone would be used to adjust its trajectory and place it in a proper orbit. Rather than satellites encased in sleds, however, how about sheds? Ice-fishing sheds. Or whole suburbs, thrown into space. (Related: Hurling Taj Mahals into the Sky and Mineral TV and the Archipelago of Abandoned Shopping Malls). If the rate of acceleration was constant, you could maintain a constant g-load if you used a giant spiral rather than a giant cirle. I don't know why you would want to, but you could. In which case I could thing of a nice jetty for such an application. I think the article said sleds, not sheds. There must be some joke I'm missing here. This would be most useful for delinquent children. One could always threaten to put them on the shed sled for a couple of circumpolar orbits. Of course, the theme parks would sponsor the deal. And what a great garbage chute! e-tat, i completely agree. my first thought was "aha! finally a good way to get rid of nuclear waste!" Maybe thats what is creating the magnetic forcefield around the Island on ABC's "Lost"